Contemporary art addresses a time in which mythology was supplanted by factual knowledge, in which science is measured in terms of the economy, and ideology was substituted for religion, and in which their number-ridden language leaves no room for imagination. In confronting this world, art revives the space of the indefinite, loaded with possibilities and their inversion, so as to hold the irrational against all-out rationality. In doing so, art must remain to its own standards, taking excursions into the unforeseen to discover the unforeseeable. 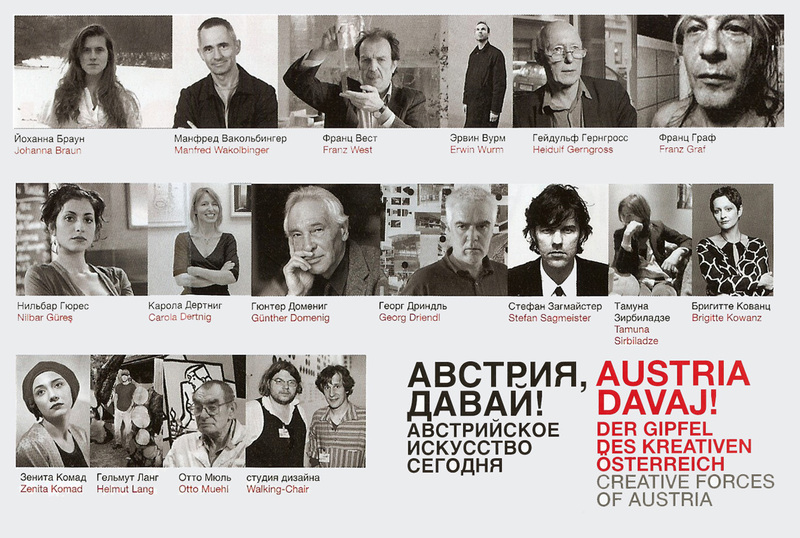 Concurrently the exhibition “Austria davaj! The creative forces of Austria” is being shown at the Shusev State Museum of Architecture. The exhibition brings together seventeen individual artistic stances, which have helped to define their respective fields while at the same time defining all traditional categorizations. The spectrum ranges from young artists just beginning their careers to artists, architects and designers of international importance who attempt to uncover the most extreme limits of Austria’s creative energies. In 2002 the MAK has already shown the exhibition “Davaj. Russian Art Now.” from the Laboratory of Fine Arts in Russia in Berlin, Cheboksary (Chuvash Republic) and Vienna with great success.